Coach Will Duddleson: Class- C coaching license Attended and played soccer at York College of PA. SAM Soccer Coach in Germantown, MD for 3 years. Specializing in 3 and 4 yrs old. One on One and Team training experience. 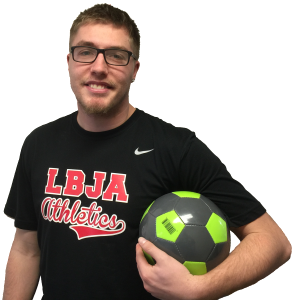 Will has been coaching and teaching physical education with LBJA since 2013 in age ranges from 4 to 9. Physical education is an integral part of the total education of every child in Kindergarten through Grade 12. Quality physical education programs are needed to increase the physical competence, health-related fitness, self-responsibility and enjoyment of physical activity for all students so that they can be physically active for a lifetime. Physical education programs can only provide these benefits if they are well-planned and well-implemented. Reinforces knowledge learned across the curriculum.Serves as a lab for application of content in science, math and social studies. Quality physical education can influence moral development. Students have the opportunity to assume leadership, cooperate with others; question actions and regulations and accept responsibility for their own behavior.